@travelpinay writes an enriched article on a museum founded by a team of Korean master painters in the heart of Quezon City, in the Philippines. 'Island art' which boasts of a 3-D interactive museum, prides itself as Asia's 3-D trick art and illusions of great artistic mastery. Want to take a selfie? Be a part of 'Art', visit this blog for beautifully astonishing pictures in 3-D ! @talentedkid enunciates the causes of poverty and why it is a thriving 'environment' for crime and health related issues. He surmises that the best solution to poverty is education. @praise-eu explains what a healthy breakfast should be about, nutrient giving foods to nourish our bodies and keep us healthy. Learn the numerous benefits of taking breakfast and why it is a must for everyone. Hmm..!.You would fall in love with donuts, with this great recipe for making them. Learn with @greatwarrior77 how to make them colourful and yummy. @euronation writes on time being a determinant factor in the fulfilment of life's purpose, our life's journey. For there is an appointed time to everything underneath the earth. Learn why solutions to certain problems might be delayed in response. Follow your passion to make a better daily experience! That is a line from @coderzairos' post in which he advises One to pursue their passion, their talents, those things that make for happiness. We don't need to go chasing a dream where we are not made of. @mrtaleb sees life as filled with twists and turns. A story of a man struggling with homosexuality, with tears wetting his post, as to how he came this low. He pours out his heart and seeks the grace of the only one who can deliver him from this addiction, this fatal attraction -God. A touching story of depravation and the little little steps towards triumph. With a new identity, he finds his way slowly home. The Igorots, a land of rich cultural heritage make music with all kinds of exquisite cultural instruments in @cassyjanine's blog. @sandrazeal11 speaks of her excitement at being hosted for the very first time, at steemgigs discord talkshow and the insight gained by interacting with her motivator and steemit's super-hero, @surpassinggoogle. Overstretching our muscles could happen in the process of hustling around to complete different tasks. @amelin expounds on the treatment and the need to engage in activities that would improve the functioning of muscles, against those that could increase the risk of muscle tear. @dyanna tutors us on the health benefits accruing to the use of cayenne flower. Reading this post will expose you to the many advantages of this wonder flower. Congratulations to all featured! Thanks to @surpassinggoogle and yourteam for all the efforts! Woah thanks for the feature!! Never really thought I'd be in here :D thanks alot! Congrats @jysui! Really deserving of the feature! Congratulations to all, specially @jysui. Congrats to all those who got upvote rewards for their posts. Awesome job @surpassinggoogle and team #untalented. We're lucky to have a visionary and creative leader in our untalented family. Keep rocking and changing your lives. The revolution is just happening. Let's all embrace it. 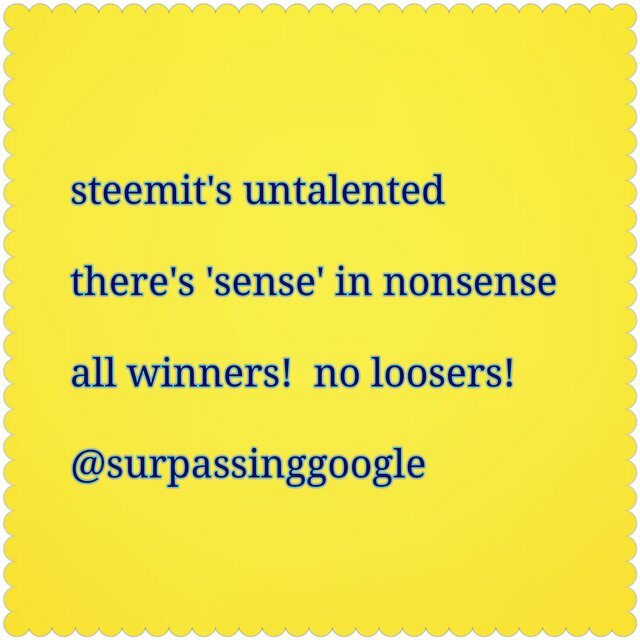 @steem-untalented that's really great work and the slogan is awesome "There is Sense in Nonsense, All Winners and no Looser here." great project by @surpassinggoogle. LOL. Congratulations to all those featured. Keep being amazing. Our undying support is with you always. Congrats @jysui for being featured here. Truly you deserved it. Wowww thank you ate @jewel! !